Today, I came up with a fun name for my recipe sharing every Sunday (next week it'll be Monday because I'll be out of town on Sunday)...it is now called What's Cookin' Sunday! I really like it, I think it has a really nice ring to it. Anyway, today I decided to make another Indian dish, Beef Curry, and a spicy spaghetti squash with black beans recipe I found off Whole Foods' website. 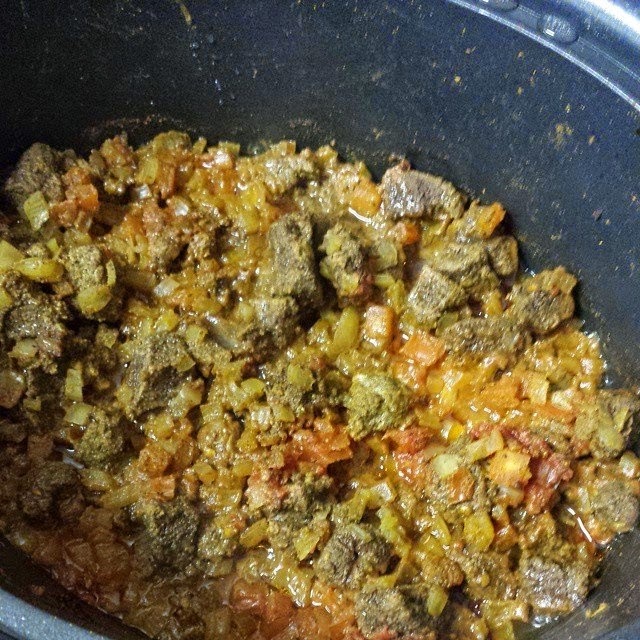 • grab your slow cooker and add the stew meat to it. • add in the cinnamon, curry powder, cloves, and cardamom. stir well. • add in the remaining ingredients and stir again to mix well. • cover the slow cooker and allow to cook on high for 6 hours. • preheat oven to 375°. arrange squash in a large baking dish, cut-sides down. pour 1/2 cup water into the dish and bake until just tender, 30-35 minutes. rake with a fork to remove flesh in strands, leaving the shell intact for stuffing. • for the filling, heat oil in a large skillet over medium heat. add onion, jalapeno and bell pepper and cook for 2 minutes or until soft. add beans, corn and chili powder; cook, stirring frequently, 1 minute longer. add cooked squash, cilantro, lime juice and salt, cook 1 minute longer until heated through. 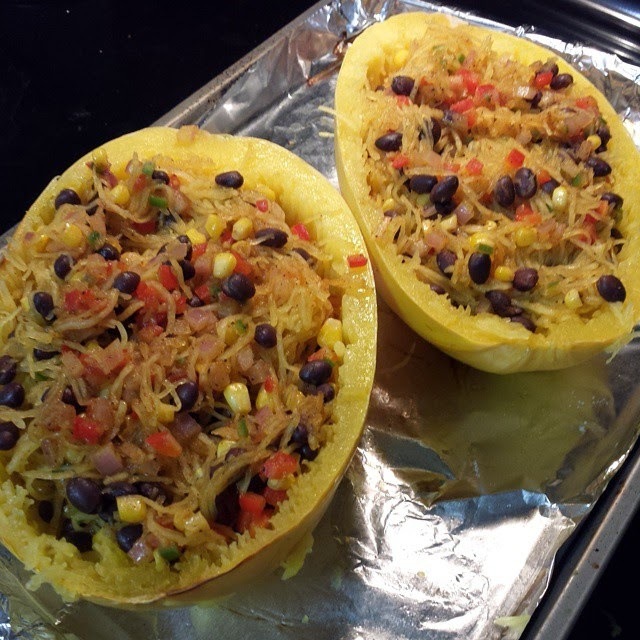 • fill squash halves with filling, mounding mixture in the center. Small note here, the recipe from Whole Foods' website says this makes 4 servings, but I opted to make it 2 LARGE servings based on the nutrition facts because with 4 servings, it only has like 167 calories and for this to be a main dish for dinner, it should really be more than that. Also, as I know at least a couple of my readers are vegetarian or vegan, this recipe is 100% vegan. Enjoy!